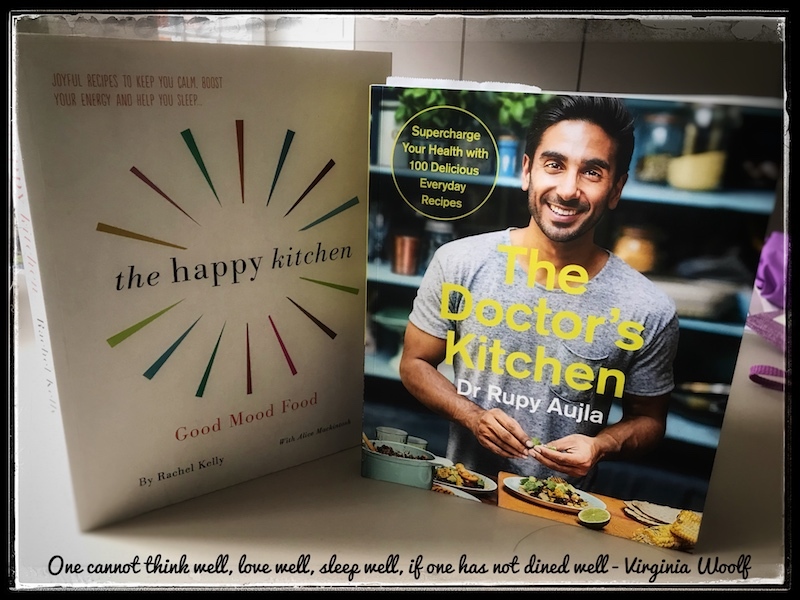 Last week, I had the absolute pleasure of attending an Action For Happiness event in London called Eat Yourself Happy where Rachel Kelly, Alice Mackintosh and Dr Rupy Aujla were speaking. And so, for this week’s blog, I am returning to my all time favourite topic: food. I feel that food and I have a pretty tense relationship to be honest… perhaps an unrequited love: I love food, but I’m not sure food always loves me. I’ve written before about my lack of control over my diet. With me, it seems to be all or nothing – I’m either super healthy… or I’m constantly eating chocolate (I definitely have an unrequited love for Cadburys). And my relationship with food is something I have been trying to change for a long time. And so, bringing my mum (who shares my enthusiasm for anything foody) along with me, I was excited to hear what Rachel, Alice and Dr Rupy had to say. For those of you who don’t already know, Rachel Kelly is an author and journalist, who says that she is, ‘constantly amazed at the power of nutrition’. She describes herself as an ‘expert patient’ having been really ill in the past with her mental health, Rachel started looking into things she could do, beyond drugs and CBT, to help her mind. Eventually, she came across ‘Happy Foods’, and, with the help of Alice Mackintosh, a nutritional food therapist, not only did she experience, first hand, the positive impact these foods had on her health, but she also wrote The Happy Kitchen to share the wider knowledge she gained. GP, Dr Rupy Aujla, also discovered the power of nutrition as a patient. At 24, he started experiencing serious episodes of heart palpitations 2-3 times a week. Nobody knew what was wrong and it was eventually suggested that he should have a medical procedure to fix it. However, on the advice of his mum, he decided to postpone this for six months and try making lifestyle changes to see if it made any difference – starting with his diet. 18 months later, his episodes had entirely stopped, without any medical intervention. Ever since, Dr Rupy has been looking into nutrition, advising his patients, even writing recipes for them. Then, two years ago, he started his YouTube channel The Doctor’s Kitchen where you can find recipe videos with incredibly informative explanations on all the ingredients he uses and why. A big theme of the evening was how much our mind and gut are connected, not only because Rachel had such a positive experience with nutrition, but because Action for Happiness is an organisation committed to taking action for a happier world. When I looked into this connection further, I found that the gut has been described as ‘the second brain’. Our gastrointestinal tract is lined with more than 100 million nerve cells. The main role of this (named the enteric nervous system or ENS), is to control digestion. This requires a huge amount of communication with the brain and studies are showing that, due to this communication, irritation in the gut sends messages to the central nervous system that can trigger mood changes. Our gut literally has an impact on our mental state (cue exploding noises in head). What’s more, Jay Pasricha, Director of the John Hopkins Centre of Neurogastroenterology, explains how this connection between the gut and brain may explain why people with bowel problems are more likely to develop depression and anxiety. So what is it exactly that Rachel and Dr Rupy did? Well, what they recommend as best for your gut (and therefore your mind), is a largely plant based diet, ensuring you have enough protein and healthy fats. In Rachel’s words, ‘Cut the CRAP’. And by this she means cut out carbonated drinks (yes, diet drinks too), refined sugar, additives and processed and junk food. Focus on having as much plant based food as possible. This includes leafy green veg, nuts, seeds, beans and pulses. And try to have them in their most ‘whole’ form as possible (e.g. eat an orange rather than having a glass of orange juice). According to Dr Rupy, a big problem today is that lots of people have just never learned to make food from fresh, and so they rely more heavily on things like ready meals… but the great thing about his videos is that they show you how to prepare fresh food! Don’t be afraid of fats but do eat the healthy kind. You need a good balance of both saturated and unsaturated fats in your diet. Unsaturated fats are found in foods like oily fish, avocados, olive oil and nuts. Saturated fats are in foods like butter, cheese and coconut oil. Unsaturated fats are great for getting our essential fatty acids (Omega 3 and Omega 6), some of which our body can’t produce, and we need saturated fats for hormone production (vital for our mood), vitamin assimilation and the proper functioning of our immune system. It’s all about educating yourself on which foods contain the good fats and which ones contain the bad. Have some protein in every meal. This doesn’t always have to be meat or fish – things like houmous are a great addition to inject some protein into your meal. Combining protein with unrefined carbs (whole grains, legumes and lots of vegetables) will keep your blood sugars at a healthy level. Vary your diet. Ancient man used to consume around 150 ingredients per week whilst we tend to have an average of about 20. New flavours stimulate dopamine in the brain and, as we know, this make us happy! Don’t go mad! This is all about our relationship with food. Don’t become obsessed with only eating ‘happy foods’. Even Alice says that she eats with happiness and nutrition in mind 80% of the time, whilst 20% of the time she is more relaxed. There is an awful lot to learn and changing our habits can be hard, however, in this case, I really think it is worth it. From personal experience, I know that my mood is so much better when I am eating healthily. And if you buy The Happy Kitchen there is a cut out guide to happy foods at the back which now resides on my fridge! Have a deliciously happy and healthy week Hubbers!